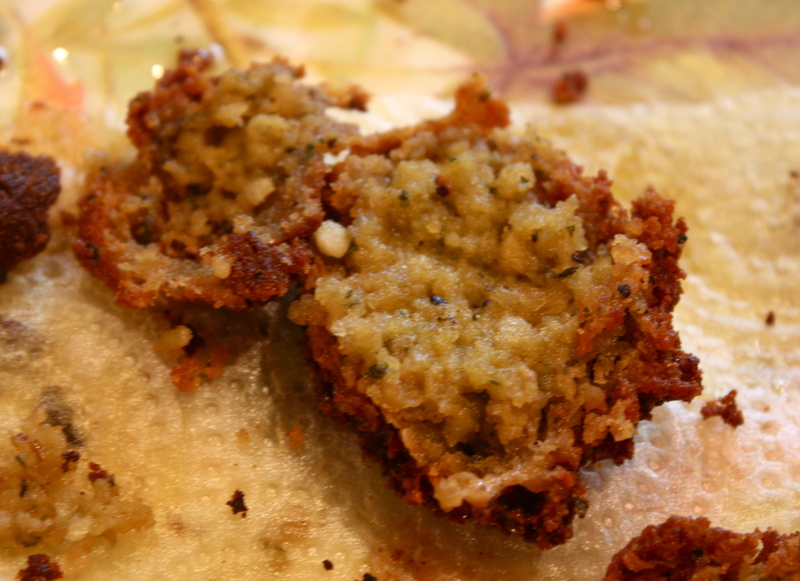 A Leftover-Hummus Falafel Experiment | "Il faut goûter"
On Labor Day, Mom made a double batch (batch?) of my basil hummus, and it was thicker than I normally make it (but no less delicious!). We had a nice late-lunch snack extravaganza, Matt included, and he commented that the leftover hummus would probably fry up nicely as falafel balls. So I’m making lunch for Mom and myself today, and here goes the experiment. 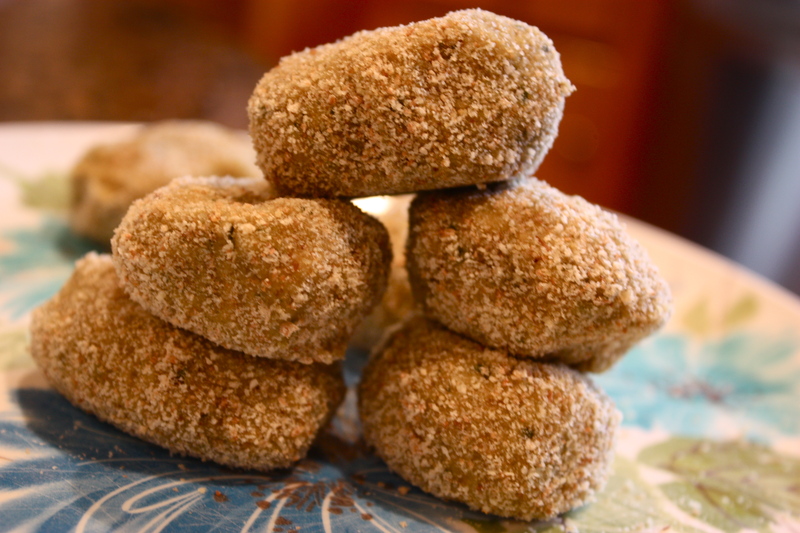 I have about a cup of the hummus, and I added 1 egg, 1/2 teaspoon of baking soda, a bit of cayenne pepper, and enough dried bread crumbs to make the mixture thick enough to roll into balls. Then I rolled the walnut-sized balls in dried bread crumbs to coat. 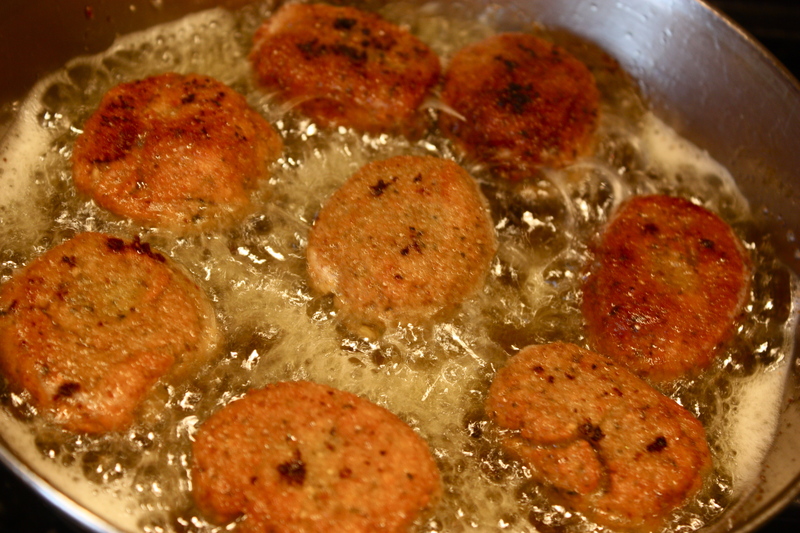 Then I fried them in oil until they were nicely golden brown. We didn’t have pita bread and were ready to eat, so I made a wrap in a tortilla: falafel balls, lettuce, red onion, tomato, feta, tzatziki sauce. Of course it was delicious (would’ve been even without the falafel)! 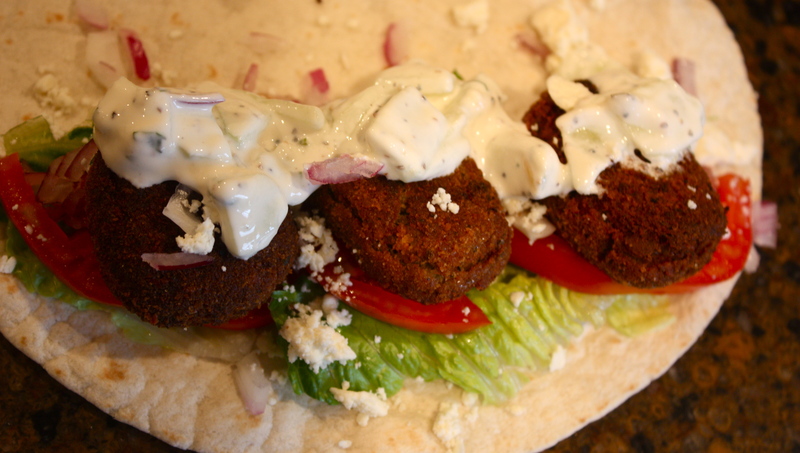 And don’t be frightened by all those z’s, tzatziki is so easy. Just mix some Greek yogurt with a bit of lemon juice, a little olive oil, thin cucumber slices, salt and pepper, and mint if you’re feeling it (I was feeling it). So the recipe for easy falafel: Start with thick hummus, seasoned according to your tastes (there are dozens of herbs and spices you could add)—>Add an egg or two as a binder—>Add bread crumbs to thicken—>Roll in balls and roll those balls in bread crumbs to coat—>Fry them up and serve as an appetizer with a dipping sauce or as a sandwich on pita bread. **Caution/Disclaimer If you make the balls too large or if your mixture starts out too thin, the falafel will fall apart while frying. 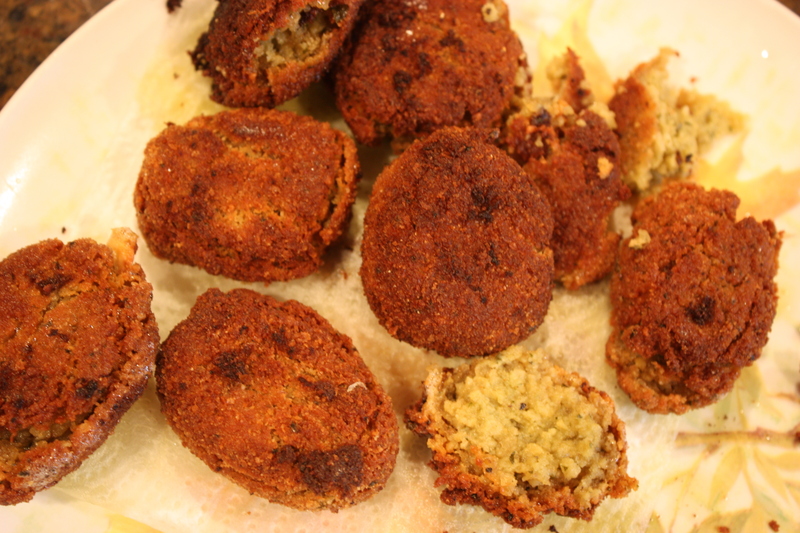 It’s not a disaster, but it results in an oily, crumbly falafel ball. This happened to a few of mine, and overall I think the texture just wasn’t spot-on. This was certainly an experiment and isn’t a perfect recipe. An extra egg might have helped mine stay together a bit better. In any case, it was a tasty lunch–a great use for leftover (homemade) hummus! Such a clever (and tasty?) way to make falafel! (Even despite the fact that some of them crumbled apart…) I have a fear of deep-frying things, otherwise I would get right on this. 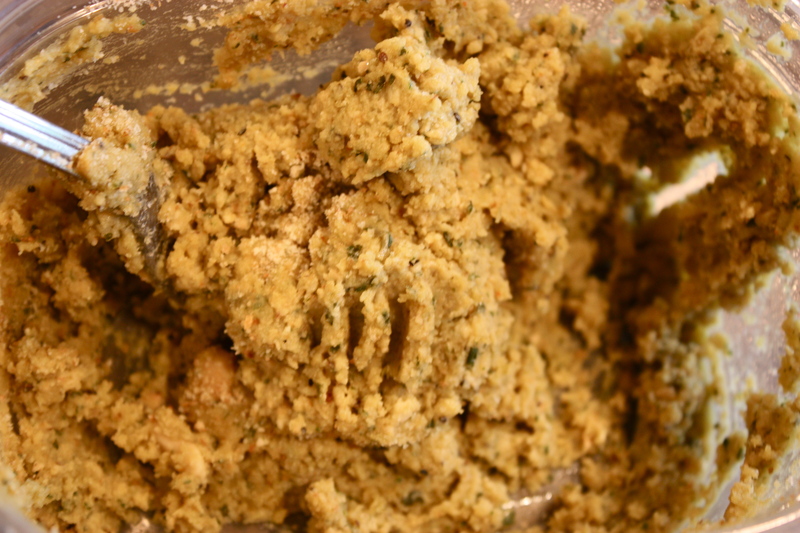 Just tried it…used 2 eggs, breadcrumbs and 1/4 c whole wheat bis quick with organic hummus. Used minimal oil…just enough to form an outer ring on my pan. Started each ball in oil then moved to center tof pan where there was no oilo cook. Added chopped organic Swiss chard and chopped sun tried tomatoes. Put a little too much lemon in my sauce but a very tasty and healthy meal all the same! Thanks for the inspiration! I tried this and it’s delicious!! !